The best reward after several years work on this Project is to see the children when they enter the Pictogram Room for the first time. Seeing how they are immediately attracted to the different visual elements making up each game, and the music, which changes as they move their bodies and which they soon find highly entertaining. these are critical skills for the development of a child with ASD which can be addressed in an entertaining way in the Pictogram Room, where autistic children and adults, with the support of their tutor or in the company of other children without autism, learn while they play. Using a camera-projector system with movement recognition technology, the image of the player is reflected on the screen, with a number of graphic and musical elements added in order to guide the learning process. To use this application, you will need a PC running Windows 7, a Kinect® sensor device, and the projection surface (television, screen or wall) on which to view the Pictogram Room images (all technical requirements are listed on the website Download). 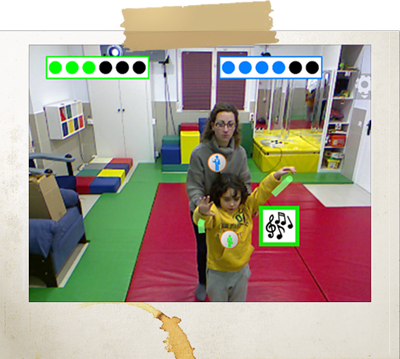 The Games in the Pictogram Room, devised to draw on the strengths of people with autism, are arranged into different sections depending on pedagogical level: Individual work, interaction with tutor, self-awareness, attention, imitation and communication. All the activities have a common structure and can be played with one or two players (student-tutor). Different visual and operational aspects of the activities can also be customised. Pictograms are one of the most commonly used alternative communication systems, and we know that most people with autism can learn to use them correctly. They can use them both to understand the world around them, when they are used to structure their physical space or time via panels or an activity diary, and also for communication with others, pointing at them in order to ask for things. However, people with autism often do not understand the meaning of a pictogram, as the slightest change in thickness, colour, etc., can make it unrecognisable. The possibility of using pictograms superposed on real life objects can help autistic people to make the connection between the true image and the pictogram in real time. Furthermore, the level of perception of body language and non-verbal communication varies in different people with autism. Many have difficulties using expressive gestures or even instrumental gestures such as pointing. The reflection of oneself on the screen, like in a mirror. The reflection on the screen of a pictogram (puppet) on top of the mirror image. The pictogram (puppet) alone, mirroring all the movements made by the player. This helps us to work using the most realistic and direct visual representation possible, until a more iconic conception is achieved, for working on more abstract concepts.